The scheme seeks to refurbish, modernise and extend the Hollis building, which lies at the heart of the Upper Chapel complex in Sheffield’s city centre. The Hollis building physically connects Upper Chapel and Channing Hall, both significant Grade II* listed buildings in the city centre. The Hollis building houses a range of supporting functions and activities vital to the function of the church community, including meeting spaces, offices and toilets. Previous internal alterations have been implemented to a mixed standard, often lacking sensitivity to the historical context. Many period features such as sash windows, stone tablets and timber panelling remained intact yet damaged, and the interior of the building was in need of general refurbishment. The client body wished to preserve the character and history of the Hollis building whilst making material alterations to improve its function and repair. The client body wished to preserve the character and history of the Hollis building whilst making material alterations to improve its function and repair. Key objectives include improving circulation, forming additional meeting space, and modernising services. Achieving an excellent quality of materials and finish was also be paramount. The works comprised the full strip out and renovation of the existing building, as well as as providing a small single storey extension to the rear of the chapel. This provided chance to improve the poor circulation by rationalising the routes, and reconfiguring shared toilets to be easily accessible by all users. Conceptually, the new extension touches the existing buildings as lightly as possible. 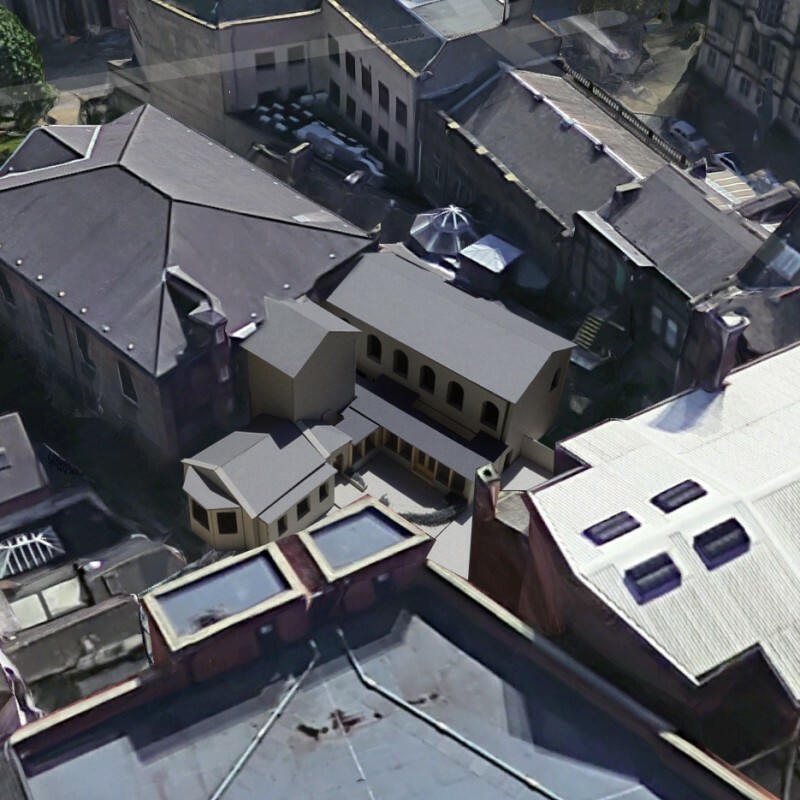 The zinc roofed extension infills the external space between the Chapel and Hollis building to create a new ‘cloister’ connecting the Chapel, Vestry, and Hollis building. As well as rationalising the circulation, this adds modest yet vital space for the chapel community’s meeting space. Large new rooflights abut the existing brickwork, allowing views of the sky and flooding the spaces with north light. Where possible, historical features are retained and celebrated. The material palette is chosen to build on the existing quality of materials found across the complex of buildings. Timber wall panelling has been restored, with contemporary new panelling to the main meeting rooms echoing this language. Sash windows have been repaired, and internalised brick and stonework cleaned. Stone flags lifted from the courtyard are relaid in the new cloister, enhancing the visual connection with the courtyard beyond.